I've created a new label called gifts. I'm a person of lists and notes. When it comes time to make a gift I find myself scrambling to remember all the possible things to do from things I've done in the past and things I've seen and thought about doing. 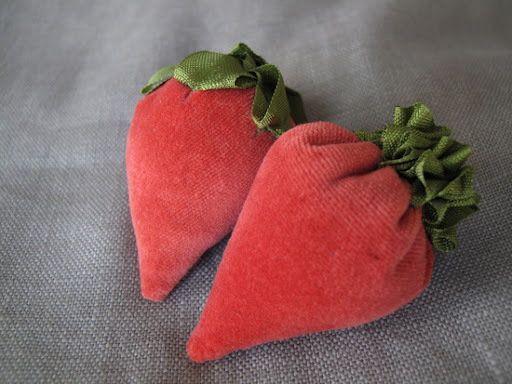 These strawberry pincushions are a great little gift for a sewing friend. 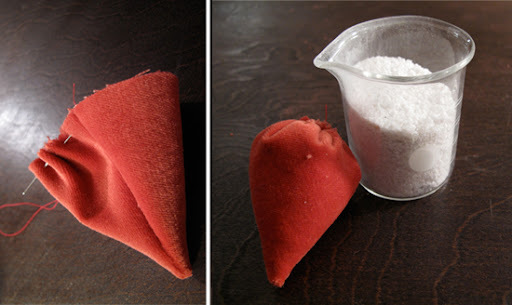 The red velvet is gorgeous and when filled with sand (for sharpening needles and pins) they become much more useful than the batting stuffed pin cushion. Using the Martha Stewart Template found here, cut out your fabric. Fold in half, right sides together and pin. 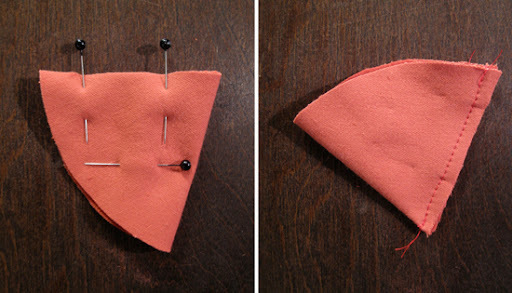 Velvet tends to move a bit so make sure to add a pin in the direction perpendicular to the pins along which you'll sew. Next, turn right side out and make sure you've got a crisp point at the end. Make a running stitch along the top. Fill the strawberry with sand, making sure the point gets filled enough. Start tightening your running stitch while letting some excess sand fall out (work over your bag of sand and try not to knock it over, like me) until you're able to close the strawberry tight. Make a few stitches on the top to secure the closure and cut your thread. There are many ways to decorate the top 'leaves'. I choose some green seam tape, I love it's sheen. 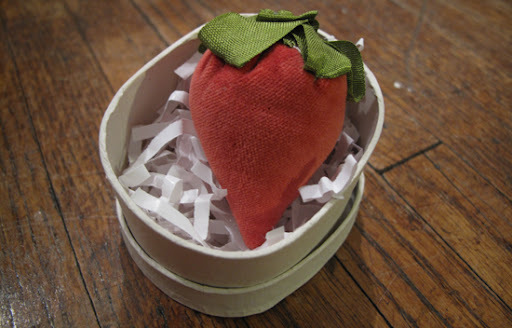 I folded it in small sections and stitched it to the berry. When you're done, you're done! I made another stawberry for myself but was runing low on the seam tape so it turned out to have a little 'fro of leaves. I'm sure there is a strawberry out there like this, little ugly duckling, who would be thrilled I made this in his likenes. This is for you, little guy.